In addition we always have a number of refurbished Kenco Coffee Machines for sale. These vending machines are professionally refurbished to the highest standards. Our in-house machine remanufacturing centre ensures that our machines get a new lease of life. Each machine is stripped down and cleaned, with tired and worn out parts replaced with brand new ones. Whether you are a vending machine provider, business or an individual, our friendly and fully-qualified team provides an affordable, environmentally-friendly alternative to purchasing new vending machines. We pride ourselves in our unbeaten, high-quality service and environmentally-conscious ethos. 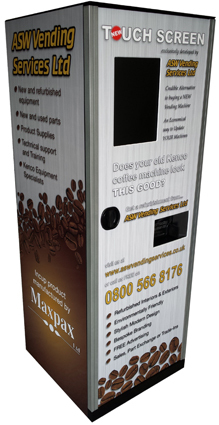 Our quality refurbished vending machines reflect our strong and passionate belief in our service. Every machine we refurbish is completely stripped, inspected, cleaned, repaired and rebuilt to market quality standards. We help our customers save thousands of pounds by returning their capital investments to service rather than investing in new machines. This is a fully refurbished Kenco Network 1280 which vends 12 different selections of hot and chilled branded drinks in 76mm paper cups. The Network comes in either the 1280 or Stretch format and has long proved to be a reliable machine, providing many years of quality service in heavy use sites, such as staff canteens, receptions and public waiting areas. The ASW TOUCH brings this quality and reliability right up-to-date with it’s new 15″ Touch Screen providing end users with the modern interface they would expect from a brand new machine….for a fraction of the cost! BESPOKE BRANDING – the ASW TOUCH can be branded to suit any environment. Whether advertising the well loved Kenco products, your own vending services or branded in the end users own colours, the ASW TOUCH always looks the part. The 100 Series has long been the perfect choice for trade counters and medium use sites. 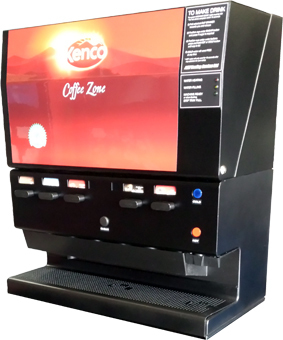 The ASW 100 is a totally refurbished 100 Series, powder coated and branded in Kenco Coffee Zone graphics (bespoke branding and finishes are available). It provides 5 selections of hot, cold or chilled branded drinks in 76mm paper cups (cabinet required for chiller option). It can sit on a counter or be supplied with a cabinet, ideal for stock storage, be plumbed to mains water or manually filled, be supplied as Pay or Free vend and offers pumped hot water and integral sugar dispensing (no need for sachets,etc).